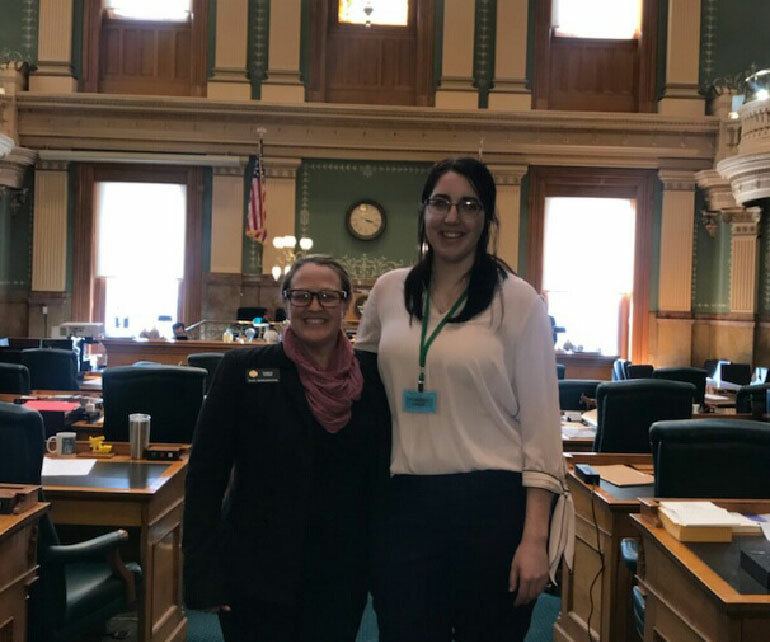 PUEBLO – Colorado State University-Pueblo senior Eliana Taylor, a political science major from Monument, is spending two days a week this semester at the State Capitol in Denver observing the legislative process, while earning credit for the experience as part of the Legislative Internship Program. Begun nearly 25 years ago, the legislative program provides students from all majors the opportunity to learn about state government and the legislative process. Because Colorado has a citizen’s legislature, the students provide an invaluable professional service to the legislature with their research and personal skills. The students travel to Denver twice a week in their capacity as interns and often spend additional days working in their legislator’s district. Students receive academic credit for their work at the Capitol. Taylor is serving as an intern with Pueblo Representative Daneya Esgar, who has been a strong a community leader and political activist for those who need a strong voice since earning a mass communications degree from CSU-Pueblo in 2001. Among Taylor’s responsibilities are office work (filing, answering phones, etc. ), responding to constituent inquiries, attending committee, and legislator meetings, organizing meetings in the legislator’s district, and compiling newsletters and other correspondence. Representative Esgar is the chair of the Capital Development Committee and vice-chair of the House Health, Insurance, and Environment Committee. She also sits on the House Agriculture, Livestock, and Natural Resource Committee as well as the House Transportation and Energy Committee. Taylor, who also is minoring in Honors, English, and Communications and Rhetoric, said she has been honored to be able to represent Rep. Esgar and to be asked to speak to various community groups on her behalf. "As a CSU Pueblo alum, it means the world to have the relationship come full circle with CSU- Pueblo students serving as such integral parts of my office,” Esgar said. “My goal as Representative is to do everything I can to best serve the people of Pueblo, and all those who work within this office are absolutely essential in ensuring we can make that happen. I am impressed every year by the drive, enthusiasm, and aptitude of the CSU Pueblo interns, and Eliana Taylor absolutely lives up to the role. She is incredibly prepared and also eager to learn and it is a pleasure for my office, and my constituents, to have her on board." According to Legislative Internship Program Coordinator and Political Science Faculty Member Gayle Berardi, many interns use their experience to pursue employment or additional experiences in the U.S. Senate and Congress after graduation. Berardi said more than 200 CSU-Pueblo students have taken advantage of this tremendous experiential learning opportunity since the program began in 1992. For more information on the program, contact Berardi at gayle.berardi@csupueblo.edu or 719-549-2679.